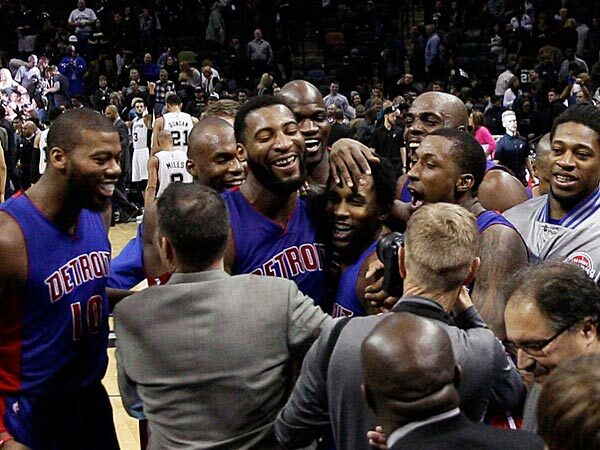 Since cutting Josh Smith something has happened to the Detroit Pistons, looking hotter and better than anyone in the NBA, picking up their sixth consecutive win since the change, 105-104 over the San Antonio Spurs as Brandon Jennings scores the game winner despite his tendency to mess up in these situations. Jennings has been the definition of anti clutch in his career: He was 1-of-20 going into this game on potential go-ahead shots with under 5 seconds left in the 4th quarter or overtime. Among players who have attempted to make it 15 times or more over the last 15 seasons, no one has been worse than Jennings himself, finishing with 13 points and 7 assists while shooting 5-of-18 from the field. The Spurs, despite having Tony Parker on the floor, let this one slip away. Holding a 104-103 lead, Tim Duncan sent a bad pass which was intercepted by Andre Drummond and allowed Jennings to attack the basket while the Spurs were in disarray and finally taste a late-game victory thanks to his own shot. He was coming off two games in which he scored a combined 64 points. 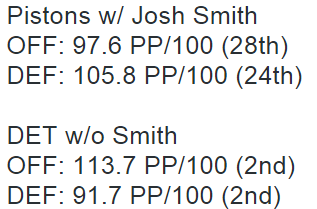 Jennings is averaging 20.2 points per game since Smith was traded, 7.6 better than while Smith was on the team. It’s incredible to think these Pistons looked destined to go into tanking mode if it wasn’t for Smith getting released. Just like Rudy Gay getting traded last season by the Raptors, there seems to be a new lust for life and especially good basketball without him on the team. Was he such a terrible influence on everyone in the locker room? Was it so difficult to simply use him less but keep him and try to teach him to adapt? We’ll never know, but for six games, it seems that all that was wrong with this team was him. Some numbers don’t lie. Besides what you see above this line, they’ve been averaging 13 more points per game, and their net efficiency in the six games is the best in the league. Their six game winning streak is their longest since the 2008-2009 season, the last time they made the playoffs. At 11-23, they still have a long way to go. The Spurs, in contrast, are only 5-9 since December 12, the same win total as the Lakers during that stretch. For once, Gregg Popovich made a coaching mistake. With a 104-101 lead he opted to foul Jodie Meeks, who hit both free throws. That was followed by Tim Duncan turning the ball over and the game winner from Jennings in front of the stunned Spurs following. The Spurs are now 21-15, and can’t seem to get a lift or some consistency when it comes to players health, as Kawhi Leonard is still out of action. The Detroit Pistons cut Josh Smith and he joined the Houston Rockets on December 22, giving him a chance to actually play 83 games this season. Since his arrival in Houston, the Rockets are only 3-4 with Smith getting into the lineup and then moving back to the bench. Maybe in the long run adding him will work out for them; used correctly he’s a very good player to have. But for now, the big winners from this exchange are the Pistons.